Another Brick in the Wall along Route 8 on March 31. By Kang Jin-cheol. Photos in a random order from our walk on Route 8. Our Route 21 guided walk. Sunrise was at 6:21 a.m. and sunset will be at 6:54 p.m.
We have a high of 14°C with little cloud to clear sky. A moderate wind (5-7 m/s) is going to blow south-east and then east. The end of a Route? The start of a Route? Route 5 by Lee Seong-gwan on March 22. Sunrise was at 6:29 a.m. and sunset will be at 6:49 p.m.
We have a wonderful high of 18°C with clear sky due all day. It’ll be a bit windy as a moderate wind (5 – 7 m/s) is going to blow east. Hopefully it’ll be a warm one. On Chujado along Route 18-1 by Kim Gum-gui on March 23. 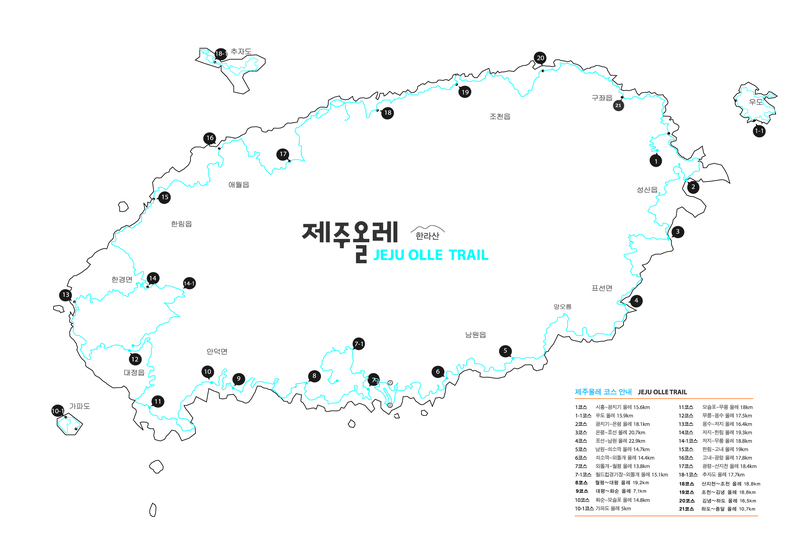 Walkers on the Chujado Route 18-1 walk will return to Jeju this morning. Photos in a random order. We had 14 walkers complete Route 16 by 3:10 p.m.
Sunrise was at 6:33 a.m. and sunset will be at 6:48 p.m.
We have a high of 11°C with little cloud to clear sky due throughout most of the day. A light wind (2m/s) will blow south-east and get slightly stronger as some more clouds appear later in the afternoon. It could still be chilly outside so remember to add that extra layer. The Deep Blue Sea along Route 15-B. Taken by Lee Seong-gwan on March 15. Route 18 | Guide: Choi Gi-seon | Pre-registered Walkers: 19 including a visitor from Singapore. There was no guided walk on the trail. Sunrise was at 6:41 a.m. and sunset will be at 6:43 p.m.
We have a high of 15°C with patchy cloud to clear sky and a light air (1 m/s – rare for Jeju). Overall it is going to be a great day. Watch out for the rain starting in the evening and continuing onto dawn tomorrow. An Unsettled Day looking back on Route 17 towards Dodu-bong in the distance. By Lee Seong-gwan on March 10. Our guide No Jong-yeol began on Route 11 at 9:37 a.m. with 20 walkers and the 20 all finished in the afternoon. Photos in a random order. Walkers on Route 10-1 (Udo). Sunrise was at 6:48 a.m. and sunset will be at 6:39 p.m.
We have a high of 17°C with little cloud to clear sky. However, a gentle wind (4 m/s) will turn into a fresh wind (9-10 m/s) from the afternoon. Then expect some rain from around dinner time. The fine dust is not so great today. It’ll clear up by late tonight.